We decided to break our journey to Istanbul and spend a full day in Abu Dhabi for one reason only – to shop. Dubai is our usual stopover but not this time –however Fiona was undeterred. The credit cards were out and ready. If Dubai was the Holy Grail, surely Abu Dhabi had a marble clad answer or two. My research on Booking.Com highlighted the Grand Millennium Hotel at Wahda - right next to Al Wahda Mall, the biggest in town. Established in 2007 it flaunts a good retail mix of high street brands such as Armani Xchange, Gap, Mango, Gant, and Calvin Klein. Plenty of food outlets too – we had a delicious meal from an Indian outlet for next to nothing. We arrived after 14 hours on Etihad quite early in the morning from Melbourne and the cab had us at the hotel by 9.30am. I was quite happy to put our bags into storage and head out – but the reception clerk invited us to enjoy a coffee in the foyer while he worked a little magic. Sure enough, we were soon heading for the 19th floor via one of a bank of fast lifts. Room 1918 was a good size by today’s standards with a bathroom big enough for two boasting a separate bath and shower. Room colours were muted and all the expected goodies were there – full length mirror, safe, mini bar (no Diet Coke) tea, coffee and two bottles of comp water. An iron and board were a phone call away. As I said we were on the 19th floor with sweeping views over a biscuit coloured city that is obviously ever evolving rapidly judging by the number of cranes poking skyward. We enjoyed excellent Wi Fi, a big desk (international power plugs would have been nice) big flat TV and the king bed was fine. The aircon was a little noisy along with the internet/TV controller box. No complaints about the lighting however - bedside readers get their own spot. So, how was the shopping? Here is the word from a self-confessed shopaholic: “Have to say I was deliciously surprised when I walked into the Al Wahda Mall. I was expecting the poor country cousin to Dubai – and it is – but my idea of how it was going to be and the reality didn’t match up. It was superb. We were looking for sneakers for Ian and found every major brand to choose from and good discount sales on for some of the top ones including the Jack Wolfskin trail walkers he settled on. I was looking for a flat pair of neutral coloured brogues to replace the ones in my suitcase that I knew would be trashed during my upcoming Turkey travels. Unbelievably I found EXACTLY what I was looking for in magnificent soft leather in a designer brand that was down from $350 to AUD100. As always these fantastic UAE malls are places of great light, calm, cleanliness and easy to get around. Given that my hotel was virtually next door, it was perfect. 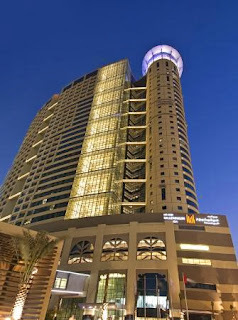 TO CONCLUDE: Very comfy modern hotel looking slightly tired but ideally located near the main Abu Dhabi shopping mall. The European concierge did not have much local knowledge when we asked about a nearby restaurant. Ian McIntosh is Australia’s Senior Traveller.